New research is using 3D printing to advance understanding and treatment of abnormal heart rhythms. The heart is the most important organ in the human body. 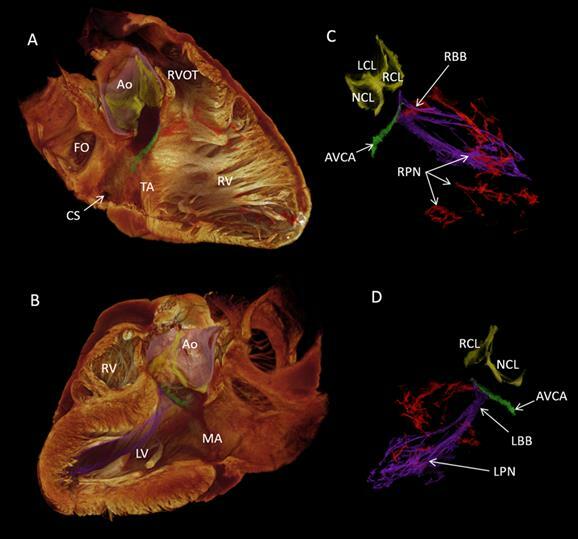 Understanding how the heart behaves is crucial for doctors conducting surgical procedures, but also of vital importance within the field of medical research. Scientists at universities in the UK and Denmark have developed a new method of conceptualising the cardiac conduction system (CCS) – the system responsible for the heart’s automatic rhythmic beat. This new technique will mean surgeons will be able to plan complex heart surgery in abnormal hearts without damaging precious tissue. The CCS of the heart consists of several components, each of which are critical to the functioning of the heart. These components include: the Sinoatrial Node (responsible for excitation signals), Atrioventricular Node (responsible for delaying the signal), bundle of His (which transmits impulses from the Atrioventricular Node), and the Purkinje Fibres (working with the bundle of His to spread the waves along the ventricles, causing them to contract). Scientists from Liverpool John Moores University (LJMU), The University of Manchester, Newcastle University, and Aarhus University in Denmark are now able to visualise this conducting system in a 3D format via their new study. It has been titled: “High resolution 3-Dimensional imaging of the human CCS from microanatomy to mathematical modelling”. The findings were published in the academic journal Scientific Reports. Data from the study provides a more detailed approach to analysing the heartbeat than that which is currently available on computer models. By revealing the exact location of the CCS in a normal heart, our understanding of widespread heart rhythms problems like heart block and atrial fibrillation – affecting more than 33 million people worldwide – should hopefully be improved. Professor Jonathan Jarvis of LJMU’s School of Sport and Exercise Sciences explained, “The 3D data makes it much easier to understand the complex relationships between the cardiac conduction system and the rest of the heart.” Once the data is captured, it can be formatted for further use. “We also use the data to make 3D printed models that are really useful in our discussions with heart doctors, other researchers and patients with heart problems,” said Professor Jarvis.